Every author succumbs to the curse of writer’s block every now and again. In fact, many artists get a similar feeling with every particular craft. Dealing with this block can be frustrating and even depressing at times. While this barrier may seem like it will never go away, there are ways to break through and allow your creativity to shine again. 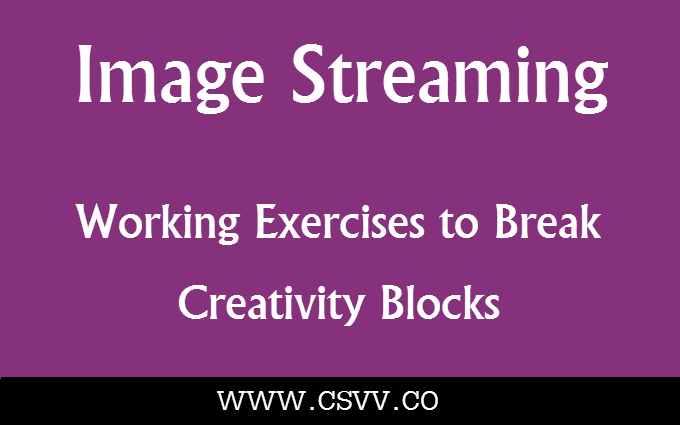 This article will provide you with tips on how to overcome these blocks and create vivid sights in your mind with image streaming, all without costing a dime! The most common way of image streaming is to get your thoughts out by talking, rather than writing. Sometimes it’s difficult to sit down at a desk and write down what you mean while it’s much easier to explain what you want to get. Dictating (talking aloud and recording it) is one way to get out your thoughts. All you need to do is explain what you are imagining, even if you need to do this in vague terms. Later, when you’re off the writing block, you can listen to this recording and pick up where you left off. Only this time, you can actually write it down. If you don’t want to record yourself but still get your thoughts out, then calling a friend who is a good listener can also help. For some people, the problem isn’t getting the words on paper. It’s conjuring an image in their mind that is the difficult part of writing or an artistic process. One way to create images, or just make them stronger, is to try meditation. This practice of clearing the mind can actually bring more images into your imagination. However, trying to force an image to appear is not likely to help. It’s more about positive reassurance and recreation than trying to traverse a huge writing wall. Try to find a quiet place where you can sit and clear your mind. For most people, from half an hour to an hour is enough time to get the image. Sadly, meditation is more difficult for some people than for others. If you can’t get images this way, then there are other approaches that you can apply to trigger them in your mind. However, these images rely on memory, so this tactic is best used when writing non-fiction or creating something based on your own life. One of the most powerful memory triggers is smell. If you remember a certain smell and recreate it, then you are likely to see the memory related to the smell much clearer than before. The same sort of a trick can also work with music or visual images like pictures or recordings. Once an image has formed in your mind, even a simple one, you can use symbolism to expand on it. Some aspects of symbolism are complicated, but others are just as they seem. Symbolism can vary depending on culture, time period, and even the color of what you are describing. Symbolism opens many doors to the art world, making expanding your thoughts and images easier than ever before. Even simple dream dictionaries rely on symbolism, so checking one of those can also help. Even though it’s not used for thought expansion, it can add deeper meaning to a story or piece of artwork. In conclusion, even though it may be difficult to open up your mind to vivid images, get them down on paper or try one of the methods listed in this article. Surely one will work for you. By following these techniques, you can bypass the writer’s block and get your creativity flowing freely!